CEDAR RAPIDS, Iowa (June 6, 2014) – CRST International Inc. Board Chairman John Smith today announced that the new approximately $37 million company world headquarters will be constructed in downtown Cedar Rapids pending final approval of state and local financial assistance which is expected in mid-June. A groundbreaking ceremony is scheduled later this summer on the site of the former First Street Parkade, on First Street Southeast between Second and Third Avenues. 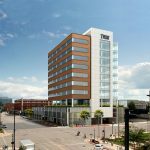 CRST will occupy two floors of the 11-story, 113,000 square-foot office tower, which includes eight floors of Class A office space built above three floors of parking. The parking garage will accommodate approximately 240 vehicles, and ground-level retail space. The building will be completed in the first quarter of 2016. Smith shared today that Bankers Trust will be the anchor tenant of the building, occupying the top two floors of the building in order to expand its commercial and private banking, residential mortgage and trust and wealth management services. The bank also is leasing street level space that includes a full-service retail branch, including a drive-through teller and ATM services. 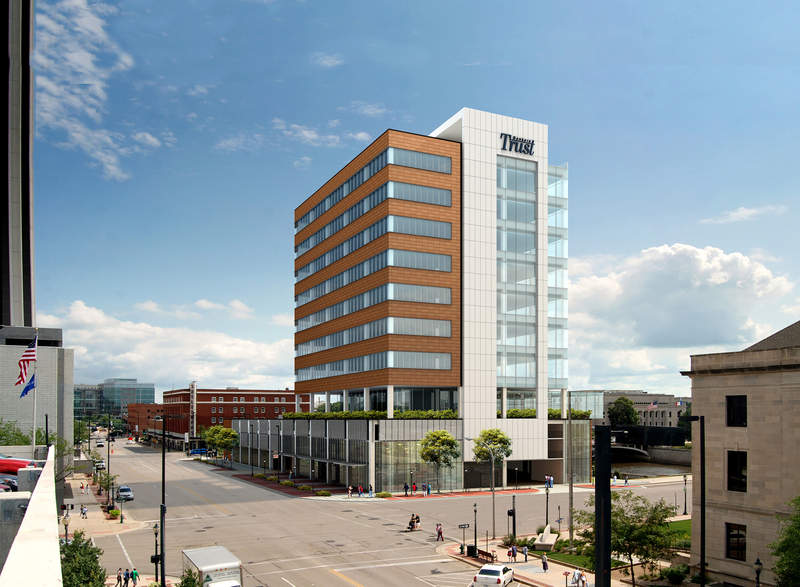 As a result of this move, Bankers Trust will increase its office space in downtown Cedar Rapids by 50 percent. Since inception the Bank has grown to be one of the largest banks in the Corridor, now with over $430 million in assets. 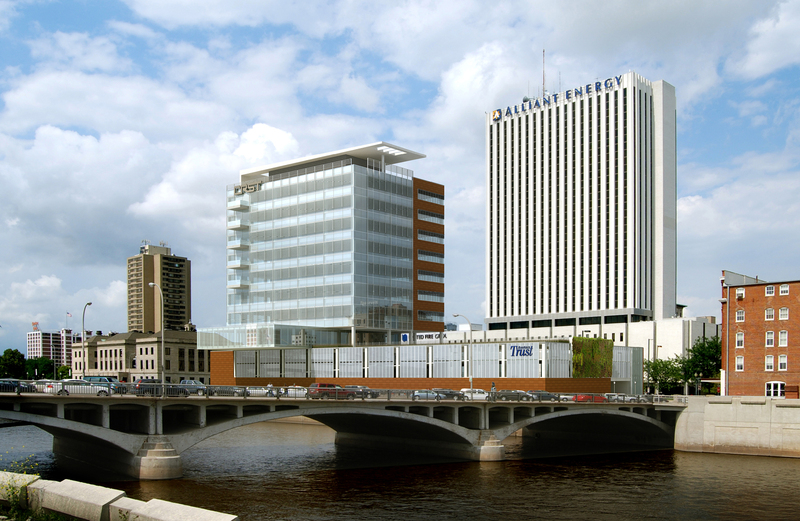 Bankers Trust is Iowa’s largest independently owned bank with consolidated assets of $3.4 billion. The building is positioned to take advantage of the extraordinary river views and to provide maximum exposure from Interstate 380. It will be designed and constructed to accommodate the city’s future flood mitigation efforts. The second floor will cantilever and extend over the water. There are balconies on the top five floors that will allow full views up and down the river. The space is column free for the tenants and offers a functional and efficient floor plan. Marc Gullickson, President Midwest Region for Ryan Companies, will lead the team as general contractor. Dan Thies, President of OPN Architects, will lead the architectural team. 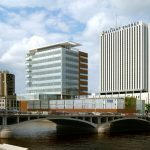 Dee Baird, president and CEO of the Economic Alliance, says this significant investment in downtown Cedar Rapids is a huge win for the city. Cedar Rapids, Iowa–based CRST International Inc. is one of the largest privately-held transportation companies in the United States. Through its seven operating companies, CRST provides a broad array of transportation solutions, including expedited van, flatbed, dedicated services, brokerage, transportation management, high value product white glove moving services and expedited temperature controlled team services. CRST’s operating companies are made up of CRST Expedited Inc., CRST Malone Inc., CRST Dedicated Services Inc., CRST Logistics Inc., Specialized Transportation Inc. (STI), Temperature Controlled Team Service (TCTS) and BESL Transfer Co. For more information, visit www.crst.com or call (800) 736-CRST (2778).